Plastic PE PP PPR PE-RT Pipe Extrusion Line PE series plastic pipe extrusion / making / production line is mainly used in the area of agricultural water supply system, architectural water supply system, pavement of cables, etc. This PE PP PPR PE-RT pipe making machine group consists mainly of vacuum calibrating tank, haul-off unit, cutting unit, tilter, etc. single screw extruder and haul-off unit have applied imported A/C inverter, both vacuum pump and driving motor have applied excellent products. The haul-off unit includes two-claw type, three-claw type, four-claw type, six-claw type, eight-claw type, ten-claw type, twelve-claw type, etc. Scraps free cutting, saw cutting or planetary cutting can be applied, the property of machine group is reliable, the production efficiency is high. With special device, it can produce inner wall spiral pipe, inner wall hollow pipe, and core layer bulpo pipe, etc, it can also produce PP, PE, ABS, PPR, PEX, silicon core pipe and pipe material of other material. The planetary cutting machine is fully automatic computer digital control, it has such advantages of simple operation, reliable property, etc. It has reached world advanced level. 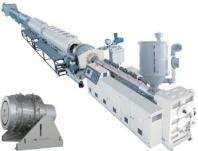 Our company is specialized exporter, manufacturer and supplier of Plastic PE PP PPR PE-RT Pipe Extrusion Line in China.